The bruising midterm primaries are over. What have we learned about the 'blue wave'? Seven months of dozens of contests — and some surprising results — have revealed much about what each party has going for it (and doesn't). 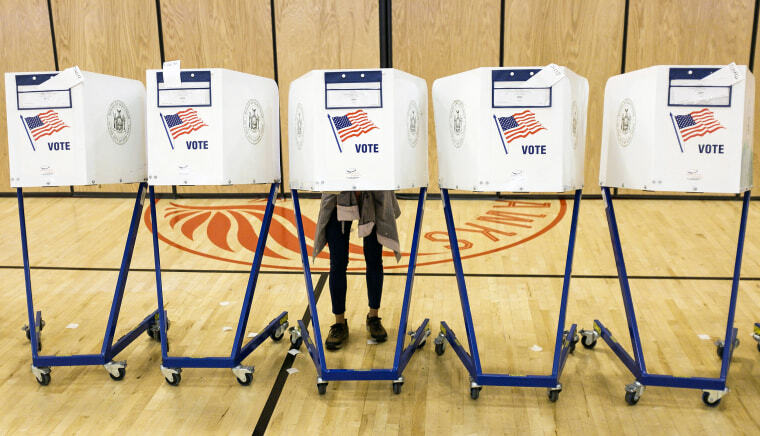 WASHINGTON — With this year's primary season now officially closed, the seven months of Democratic and Republican contests from Texas in March to New York on Thursday offer rich lessons about each party's most loyal voters. They appear angrier and further apart than ever, setting up a titanic clash in November's crucial midterm elections for control of Congress, now just eight weeks away. The Republican base now belongs to President Donald Trump and the GOP has placed a big bet on turning them out in November. Nearly a decade after the insurgent tea party movement began challenging the Republican establishment on ideological grounds over issues like taxes and the size of government, the GOP primaries were all about one person: Trump. "The importance of being loyal to Trump in this year's GOP primaries is remarkable," said Alex Conant, a Republican strategist and former adviser to Sen. Marco Rubio, R-Fla. "Many of the primaries boiled down to which candidate appeared most in line with Trump's brand of politics. Past arguments like conservative credentials or electability were not very salient messages." In primaries where Trump himself intervened, his favored candidate won nearly every time. The president almost single-handedly helped Rep. Ron DeSantis win the GOP nomination for governor in Florida. Rep. Mark Sanford, R-S.C., who has been critical of the president, lost renomination after attacks from Trump. In Kansas, Trump helped push controversial Secretary of State Kris Kobach over the finish line, even though other GOP officials favored his opponent. And Trump even stopped some Republicans from running entirely, like Sens. Jeff Flake of Arizona and Bob Corker of Tennessee, two of Trump's most vocal critics in his own party who decided not to run for re-election after realizing they couldn't overcome voters' loyalty to Trump. "I could not win in a Republican primary. That's the bottom line," Flake said on MSNBC. "You can't question his behavior and still be a Republican in good standing." The primaries offered important real-world data about the kinds of voters who are likely to show up in November. That's crucial, especially for Democrats, since their supporters tend to stay home when the presidency is not at stake. Kyle Kondik, an analyst at the University of Virginia's Center for Politics, cautioned that while primary turnout is not necessarily predictive of general election turnout, the trend is clear when taken with other data, like fundraising, polling and even hiring on K Street, the Washington home to many lobby firms, which are rapidly recruiting Democrats in anticipation of a change of power in Congress. "When you put the primary turnout in the context of other indicators, you get a lot of data pointing in the same direction — toward a promising political environment for Democrats in the fall," he said. Democrats are trying to channel the energy of the anti-Trump "resistance" into votes in November without being burnt by it, and they cleared the first hurdle in the primaries. Gov. Andrew Cuomo's victory over progressive challenger Cynthia Nixon in New York on Thursday occurred eight years to the day after the unelectable Christine "I’m not a witch" O’Donnell won a GOP Senate primary in Delaware that cost her party a winnable seat. It's a fitting echo after a Democratic primary season that, unlike the 2010 tea party wave that O'Donnell was a part of, saw mainstream candidates win more often than not, especially in swing districts and states, such as in Michigan's gubernatorial primary. The strength of the establishment was especially notable in the early presidential nominating states, which suggests the Democratic electorate in those places may not be clamoring for another Bernie Sanders-style insurgency in 2020. But some of those establishment victories left bruised feelings in their wake, so Democrats better hope progressive voters turn out in November, even if their favored candidate isn't on the ballot. The Democratic voters who are usually least likely to show up in midterms are young people and people of color, but they stepped up in the primaries and could remake the electorate in November. While progressives lost in quantity, they arguably made up for it in quality, scoring a few high-profile upsets where it mattered most. And it's not a coincidence that nearly all of those victories came from candidates of color. Andrew Gillum came from behind to win the Florida Democratic gubernatorial primary, days after rallying with Sanders. Alexandria Ocasio-Cortez in New York and Ayanna Pressley in Massachusetts knocked off a pair of longtime white incumbent congressmen in diversifying districts. Looking ahead to the presidential contest, it suggests that a candidate who can win both people of color and young white progressives may be best positioned. And that shouldn't be too much of a surprise, since it's how Barack Obama beat Hillary Clinton in the 2008 presidential primary. Repeating that formula in November is a tall order and an untested approach in midterms for many states. But it's key to the strategies of candidates like Gillum and Georgia's Stacey Abrams, who are each hoping to become their state's first black governors by mobilizing hundreds of thousands of African-Americans who don't typically vote. If they succeed, it is sure to inform the strategies of 2020 White House candidates, since presidential electorates tend to be even more diverse than those turning out for the midterms. The #MeToo movement and Trump's election has fired up women like never before, but almost entirely on the Democratic side. Suburban white women in particular could be crucial to Democratic successes in November. They traditionally lean Republican, but there's some evidence to suggest they're quietly switching sides. Where Democratic upsets did occur this year, they often involved women, such as Amy McGrath in Kentucky and Kara Eastman, who narrowly beat a former congressman in a Nebraska primary (not to mention Ocasio-Cortez and Pressley). Overall, a record number of women have run for office this year, according to the Center for American Women and Politics at Rutgers University. A whopping 476 women ran for Congress, shattering the previous record of 298 set in 2012. And November will see 32 all-women congressional matchups, easily surpassing the previous record of 19. Democrats are largely driving that surge. Three-quarters of female House candidates this year are Democrats, while 53 of Democratic women have won their primaries, compared to just 44 percent of Republican women, according to the Rutgers data. Nearly nine-in-10 Democrats (87 percent) say the country would be better off with more women in politics, compared to just 49 percent of Republicans, according to a June NBC News/Wall Street Journal poll. They'll need that support when those women try to help Democrats win the 23 seats they need to flip the House of Representatives. CORRECTION (Sept. 14, 2018, 10:50 a.m. ET): A previous version of this article misspelled the last name of an analyst at the University of Virginia's Center for Politics. He is Kyle Kondik, not Kondick.